Polar vortex: What is it, and when is it going away? Schools have been closed and residents have been warned to stay inside after reports of historically low temperatures in the Midwest. NBC's Dylan Dreyer reports from Green Bay, Wis.
Move over, haboob. See you next summer, heat dome. The weather phenomenon hogging all the attention now is "polar vortex." Twenty-six states are under wind-chill warnings or watches, and the polar vortex is to blame, breaking loose from its North Pole confines and plunging the country in a deep, dangerous freeze. "Think of this as a polar hurricane," said NBC News' Al Roker. 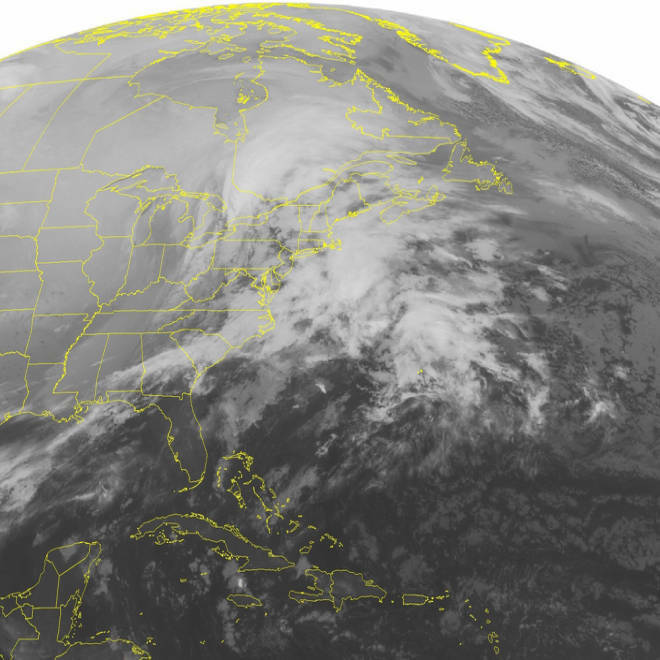 NOAA satellite image taken Monday, Jan. 6 at 01:45 a.m. So what exactly is a polar vortex? A polar vortex is basically a great swirling pool of extremely cold air located tens of thousands of feet in the atmosphere, said Frank Giannasca, senior meteorologist with The Weather Channel. Basically an arctic cyclone, it ordinarily spins counterclockwise around the north and south poles. While it tends to dip over northeastern Canada, it’s catching everyone’s attention because it has moved southward over such a large population — as many as 140 million Americans are feeling the freeze. Why has it traveled so far south? There’s a variety of reasons why a chunk of cold air over Canada would break off our way. Chiefly, warmer air builds up over areas such as Greenland or Alaska, and that air forces the colder, denser air southward. Also, weather patterns can create the right conditions for the polar vortex to point south. But in this case, “this very well just may be one of those anomalies where it forces itself southward,” Giannasca said. Is this a rare phenomenon? Through the course of a winter, the arctic air can get displaced southward, typically into the eastern U.S. But it is uncommon for such cold air to cover such a large part of the country, happening maybe once a decade or longer. Amplifying this polar vortex are the extreme cold and brutal winds — sending places such as Fargo, N.D., at 32 below zero and Madison, Wis., at minus 21. Add the wind chill, and it will feel like minus 50s and 60s in some parts. Could there be a polar vortex of this magnitude again this winter? Forecasts show temperatures around the country as a whole will begin moderating by the end of the week — that means the 20s and 30s in the Plains and Midwest, while parts of the mid-Atlantic and Northeast could be in the 40s. But, like any unpredictable weather phenomenon, whether or not this can happen again, “is hard to say,” Giannasca said.